You’ve got to get creative. In the Internet age, customers are becoming increasingly desensitized to advertising and marketing by brands. After all, thanks to viral sensations on YouTube, Facebook, Twitter and Vine; your customers really have seen it all before. If you want your brand, business, or product to be talked about in this day and age – you can’t just think outside the box. You’ve got to throw away the box entirely. If you want to be remembered, create a buzz, go viral or just get people talking; you’ve got to create something that’s never been seen before. You’ve got to create an amazing PR stunt. Some brands – big and small, household names and names you’ve never heard of – are getting this really, really right. Whether it’s causing uproar on social media, scaring people silly, or simply giving us that warm fuzzy feeling; PR stunts are becoming one of the most common ways for brands to get noticed. Let’s take a look at some examples of the World’s greatest PR stunts. No list of great PR stunts and campaigns would be complete without a nod to the hugely successful “Share a Coke” campaign from Coca Cola. The global beverage brand wanted to boost sales and consumption amongst a younger demographic and replaced its iconic branding with 150 of the UK’s most popular names in 2013. Coupled with experiential campaigns such as the Happiness Vending Machine and Friendship Machine and plenty of social media activity, Coca Cola’s Facebook community grew by 3.5% and saw its hashtag used 29,000 times on Twitter. Brands can learn a lot from this PR stunt and marketing campaign. Check out this article from The Guardian newspaper to read more. Back in 2012, Alton Towers wanted to find a new and unique way to promote the opening of its new ride, Nemesis. The subsequent PR stunt was amazing and terrifying in equal measure and was designed to test reactions to the ride before it opened. The Nemesis Sub-Terra Lift is a great example of 3D PR and experiential marketing. Unsuspecting members of the public entered a London shopping centre lift, but as the doors they had a bit of a shock. The lift was completely bottomless, and left people staring down the lift shaft. Of course, it was all clever 3D art, but it certainly packed a punch and with over 1 million views on Youtube certainly got people talking! Another great PR stunt from Alton Towers saw mysterious smiley faces appear on sheep to promote The Smiler ride in January 2013. A few brands have tried this PR stunt in the past but only two spring to mind as being hugely successful, impactful and memorable. The first comes from cereal brand, Kellogg’s. In a bid to show that their Crunchy Nut brand of cereal was the perfect meal at any time of the day, Kellogg’s opened pop-up restaurants in Birmingham, Manchester and London. When they arrived, customers were shown to their seats by a smartly dressed waiter and asked to choose from the menu. They were given water to drink, and treated as if they were in a posh establishment. As you can imagine, this was a huge social media success! Pot Noodle also used a similar approach to launch their Piri Piri variety in 2013 with their “Chez Bloke” pop-up restaurants. Patrons were seated in Lay-Z Boy recliners, could watch widescreen TVs and were waited on hand and foot by a waitress. They were also dressed in branded onesie tuxedos. Again, this was a huge success and a powerful PR stunt for the brand. To be classed as one of “the world’s greatest PR stunts” means a stunt that gets people talking. Whether the response is largely positive, mostly negative, or a mixture of both; all the best stunts create a buzz. And that’s certainly what Morrisons did with their “Angel of the North” stunt in May 2014. 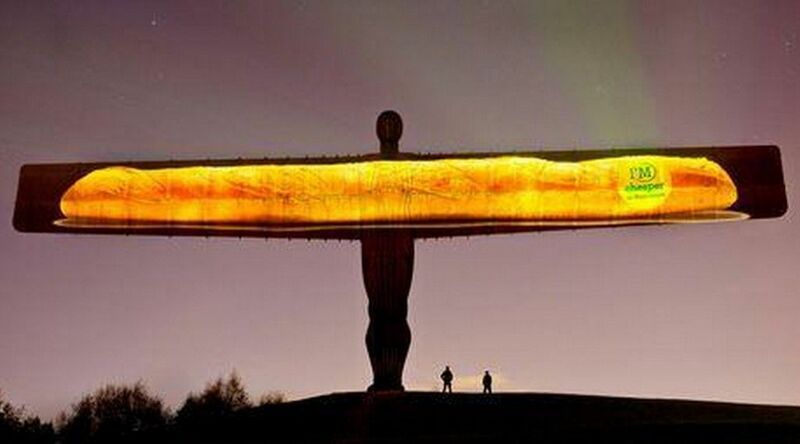 The budget supermarket projected a 54m long image of a baguette onto the wings of the 2om tall sculpture in Tyne and Wear. Alongside the image were the words “I’m cheaper at Morrisons”. As I’m sure you can imagine, the striking PR stunt divided opinion with many people offended by the stunt. Of course, this doesn’t really matter. Morrisons are a huge brand and the stunt is unlikely to have had any real negative impact. In fact, it simply brought the discussion of the advertising campaign into the regional press and got people talking about the brand. Bookmakers Paddy Power are the undisputed Kings of viral PR stunts and there were a whole host of examples we could choose to include in this list. For example; we could have discussed the time they gate-crashed the Brit awards in 2014 dressed as dance duo Daft Punk. Or their highly controversial advert surrounding the Oscar Pistorias murder trial. However, the PR stunt that we think deserves it’s place on this list comes from the 2104 FIFA World Cup. As you can expect, the furore that followed was immense. Activists and social media users erupted in anger saying that this time the bookmaker had gone too far this time. The story made global news – obviously – and had everyone talking about Paddy Power. The PR stunt didn’t end there though. 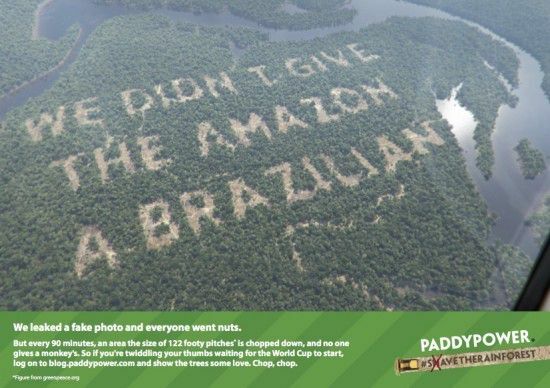 Paddy Power then backtracked saying that they’d leaked the fake photo to highlight the chopping down of trees in the Brazilian rainforest. You can read their side of the story here. Whether or not this was their original intention is still unknown. But it doesn’t really matter. People were talking about Paddy Power, the World Cup and the England team. 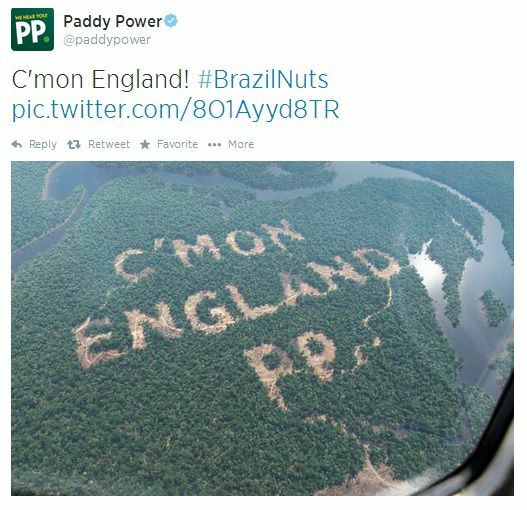 Hat’s off Paddy Power; you really are the King of PR stunts. What makes a great PR stunt? When you think of all the examples we’ve provided of ‘the greatest’ PR stunts, there are certainly a few things in common. They may not be the biggest, but they got people talking, and that is most definitely the point of a stunt like this. Customers Crave Personalisation – As the “Share a Coke” campaign proves, the modern customer craves personalised marketing. If you want to shift products, you need to look at your customers as individuals. While you don’t need to go to the extreme that Coca Cola have – unless of course you have the multi-million dollar budget of Coca Cola, in which case go ahead! – you can still personalise and tailor your PR and marketing to specific audiences. By adding a personalised element to your campaigns, you can engage with prospects and customers in a way that will encourage them to buy. Time is Key – At the risk of stating the obvious, timing really is key when it comes to implementing a PR stunt. Take Paddy Power for instance. They always react almost immediately to current affairs in a bid to get maximum impact for their campaigns. There’s now use discussing a news topic for a week and then rolling out a campaign; you need to be on it. Even if you’re not using common affairs as a basis for your PR stunt, you need to think about when you launch the stunt. This will give you maximum visibility and ensure everyone is talking about you and your campaign. Think Outside the Box – Using Alton Towers as inspiration, we can learn that PR stunts don’t have to be obviously linked to your brand or business. The Nemesis lift stunt focuses on creating the same sinking feeling in your stomach you would get on the ride and taps into the emotions of customers. This kind of PR stunt gets your customers thinking differently about your brand, and breathes new life into your marketing. Get People Thinking Differently About Your Brand – Pot Noodle and Kellogg’s Crunchy Nut used their stunts to get people thinking about their brands in a new way. Both campaigns were hugely successful and show how experiential marketing can be used to challenge perceptions and get people really thinking about the products you sell or services you offer. Try and think of ways you can do just that and you’ll have a really impactful and successful campaign on your hands. Don’t Be Afraid of a Little Controversy – In the examples we provided, both Paddy Power and Morrisons showed that – in some circumstances – controversy can be a good thing. Of course, you don’t want to go around purposely upsetting people; this would be extremely damaging for your brand. But when it comes to PR stunts, sometimes it is worthwhile being a little contrarian. After all, this is one of the best ways to get people talking and get coverage for your campaign and business. Get Emotional – Perhaps the biggest thing that these – and all other PR stunts have in common – is that they all tap into customer emotions. They all try to evoke certain emotions in their audience. Most people are emotional shoppers. They buy from brands that make them feel something, and they purchase products that make them feel something too. All good PR stunts do just that. The world’s greatest PR stunts are taking place all the time. Every day, brands are coming up with new ways to attract customers and get people talking about them. These might range from small and simple campaigns to huge stunts like the one’s we’ve looked at here. But what they all have in common is that they challenge perceptions and get people talking. Modern marketing is hugely challenging. Customers crave excitement from the brands they spend with, and expect companies like yours to be constantly pushing the boat out and moving the goal posts. It’s no longer enough to do the “same old, same old”. If you want to move forwards and grow your brand, you need to innovate and think of exciting ways you can capture their attention. At Street Advertising Services, we can help you do just that. From 3D street art to graffiti advertising, we work with brands just like you to bring your business to life in new, unusual and exciting ways. Your customers expect the best; we can help you create a PR stunt that is certainly worthy of that title. To find out more about what we can do for you and your business, contact us today.